In 1912, four devout women of the Pallottine Missionary Sisters, inspired by founder St. Vincent Pallotti’s motto, “The Love of Christ Impels Us,” left the comforts of their home and family in Bremerhaven, Germany for a life dedicated to serving those in need in rural West Virginia. They booked passage on the Titanic. As the trip neared, one of the Sister’s travel documents was not in order, forcing all of them to delay their trip. The ill-fated Titanic sailed into history without them. 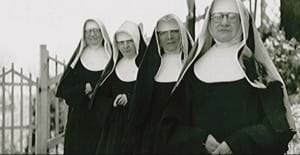 Upon arrival in America, the young Sisters were to travel to Stella Niagara, New York, where they were to study the English language under the tutelage of the Sisters of St. Francis. Minutes before boarding their train, the Sisters received an urgent telegram from the Mother Superior of the Franciscans, asking them to delay their journey until she could join them. The train departed without the Sisters and tragically crashed, killing many of its passengers. After a tumultuous beginning, the twice fortunate Sisters eventually arrived at their desired destination in Richwood, West Virginia August 12, 1912. In 1920, intent on establishing another hospital, the Sisters migrated to Buckhannon, where they purchased a private residence. This converted home became an eight-bed hospital facility named St. Joseph’s Hospital. Over 97 years later, St. Joseph’s serves as the premier health care provider in Buckhannon, offering the community compassionate, quality health care. The hospital has evolved to a 51-bed facility located within a modern, state-of-the-art health care complex with emphasis on primary care along with provisions of selected special services. A staff of over 60 highly trained physicians are supported by 425 employees including 155 nurses. In addition to our 51-bed hospital facility, St. Joseph’s encompasses a medical plaza, physicians’ offices, a Nursing Care Facility, and a Skilled Nursing Facility. St. Joseph’shas faithfully adhered to its mission of providing the community with quality health care in ways which respect the God-given dignity of each person and the sacredness of human life. At St. Joseph’s, our values reflect what we stand for, what we expect of ourselves and from each other, and what we aspire to be. St. Joseph’s remains committed to providing excellent health care and preventative programs to the people of Buckhannon and the surrounding areas. But more than ever, we are challenged by the increasing demand for medical care. In an effort to continue to meet the most critical health care needs of the community, St. Joseph’s leadership formed St. Joseph’s Foundation in 1994 with its primary goals being to actively secure charitable support, to develop relationships with community and business leaders, and to advocate and promote the hospital’s mission.